Linux is one of the best operating system for most of the system engineers, security professionals and the hackers. As Android is a Linux structured operating system it allows developers and network exploiters to make and use new android apps for network testing exploiting and hacking. Most of the people are unaware of these apps and their functionalities because they are not available on the Google Playstore, as they void the terms and conditions of Google by intruding into other peoples network and can access their information without their knowledge. But saying so, these apps are easily accessible to the general public by just doing a simple search on Google about “Wifi Hacking apps”, which will bring up results listing a ton of apps, out of which some work and some don't. 1. Zanti : zanti is the of the top Wifi hacking apps in the black market. This app is developed by Zimperium and it has a lot of downloads. Zanti is a penetration testing toolkit that allows you to perform malicious attacks on a network. Zanti can be used for MAC address spoofing, to create malicious wifi hotspot, to exploit routers, audit passwords, to create and run HTTP server on your android device, to scan a device for open ports and to perform Man in the middle attacks and also to check the device for shellshock and SSL poodle attacks. Using this app you can control the devices connected to the same wifi connection as you. 2. Dsploit: Dsploit is a penetration testing tool for the android operating system. This app is capable of performing network security assessments on wireless networks. It has functions like network scanning, vulnerability scanning, password cracking and also man in the middle attack. For running this app on your android device, your android device must be rooted and should be running on an ARM processor and must have Busybox or super user installed. After installation of this app, you will be asked to grant root access, click the grant button and you will see all functionalities this app has to offer. 4. Nmap : Nmap is a well known application in the field of network exploiters. The applications for Linux was available long back and now because of the popularity of Android and because of the advancement in the hardware technologies on mobile devices the android app was introduced. Nmap works on both rooted and unrooted ( normal ) devices. Nmap is generally used to identify the users on a network, users who are trying to connect to a network etc. Professionals use Nmap to perform network exploration and to find vulnerabilities in a network and hackers use these vulnerabilities to their advantage. 5. 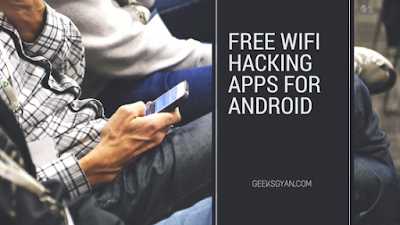 WIFI hacker Professional: WIFI hacker Professional is one of the best wifi hacking apps available for android.You can be a professional hacker by cracking WIFI passwords within seconds in front of your friends.One of the best thing about this wifi hacking app is that it is totally free and very simple to use. So these are some of the best wifi hacking tools you can use to test the strength of your network and make the changes to reduce vulnerabilities. I'm so glad Noshad that you liked this article.Hope you keep reading our posts and we are able to assist you in future too..